Halo: Reach has apparently been breached. The latest chapter in Microsoft's flagship franchise is prematurely in the wild. Bungie's Xbox 360 exclusive sci-fi shooter--prequel to the venerable Xbox-original Halo: Combat Evolved and not due out until September 14--has been unceremoniously loosed on file sharing sites. Microsoft is not pleased. That's coming out in typically circumspect statements like "We are aware of claims that a pre-release build of Reach has leaked and aggressively investigating it, but have no details to share at this time." Nevertheless, the illicitly pilfered copy appears to be bona fide, and to be a fly on the wall at Microsoft Corporate would probably involve bearing witness to some unsightly head-rolling. How did it happen? How does this sort of thing always happen. But in this case there's a twist: It seems the powers that be--not some felonious bottom-rung employee--placed it in lockdown on a public file server, then handed out keys. The file server turns out to be Xbox LIVE Marketplace, Microsoft's own virtual goods store, where a pre-release copy of Halo: Reach was on offer to select reviewers in a concealed area for a tidy hacker-deterrent sum of 99,999 Microsoft Points, or about $1,250 USD. No, that's not what Microsoft charges us to review games, and I'm guessing Microsoft was using a different security process to authenticate press. A group of modders calling themselves GameTuts learned the game was live (how they learned this probably warrants the most serious investigation), then managed to bypass Microsoft's precipitous price force-field. Code in hand, they hacked it for public play, leading initially to a few rogue YouTube videos of unrevealed multiplayer levels, but eventually--perhaps inexorably--to the code's appearance on file sharing sites. But according to a GameTuts moderator named Joakim, a public release was never part of the plan. "So after a lot of .xex [an Xbox 360 executable file extension] cracking etc., [m]e and my team finally did it, we got Halo: Reach!" wrote Joakim. "This is not released for public, and we are not really planning on releasing either." Another GameTuts member confirmed Joakim's claims. "We now pronounce this to you," wrote forum moderator Toxic in a followup post. "The team of Game-Tuts have acquired Reach." "The GameTuts staff have all participated in the work of 'Halo: Reach'. The main members of our team, Matty and Cthulhu have worked endless hours, pushing the barriers to allow our golden faces play 'Halo: Reach'. The intelligent mind of our beloved Admin, Matty worked endlessly to acquire this game, the deed was done." "The moderator of GameTuts, Cthulhu is now the man of his word to work on the game file and allow our members see 'Halo: Reach' before its release." "The words among the team came to agreement that 'Halo: Reach' will NOT be leaked, given, or distributed to any site." So much for 'will NOT be leaked' then. Note to smug hacker groups: If you release an ill-gotten game to who-knows-how-many members of your forum, don't expect them to play by your already twisted up rules. Microsoft says it's investigating the hacker grab and I'm assuming the game's been pulled from XBL by now. If you're caught running this version of the game before or after September 14, it goes without saying that you're asking for a banned or bricked console. Halo has a storied history of early leaks. 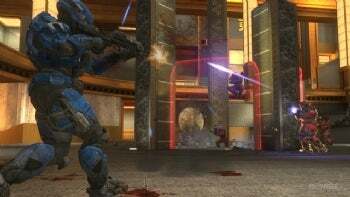 Halo 2 was stolen (in 2004) roughly a month before the game was due out, Halo 3 hit file sharing sites days before the game went on sale in September 2007, and Halo 3: ODST was "accidentally" sold weeks before its official sale date last year. Should GameTuts have been fiddling around (shamefully and illegally) in Microsoft's business? Of course not. But should Microsoft have made Halo: Reach--however bristling with security measures--available via what amounts to a public file server? Live and learn, and since keeping pirate copies off the market prior to launch day is considered commercially critical, I doubt we'll see Microsoft make this particular mistake ever again.